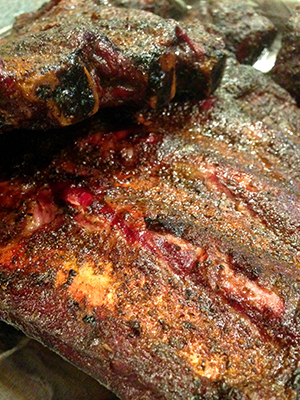 The rich, flavorful and smokey beef rib is a thing of beauty. With a dark and salty exterior bark giving away to tender juicy meat, no one can resist. Below is one of the simplest yet most satisfying recipes. Enjoy! Turn you Green Mountain Grill on (filled with Texas Blend pellets). Set your temperature to 245 degrees. Remove Membrane from the back of the ribs using a paper towel and gripping the corner. 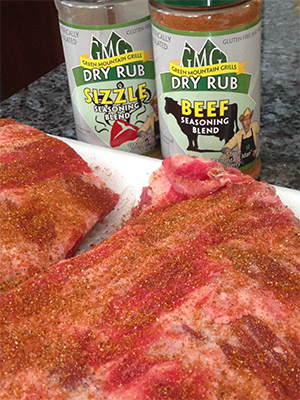 Season the ribs first with a thin layer of Sizzle rib and then with a heavy layer of Beef rub covering all sides. Place racks of ribs on- bone side down. 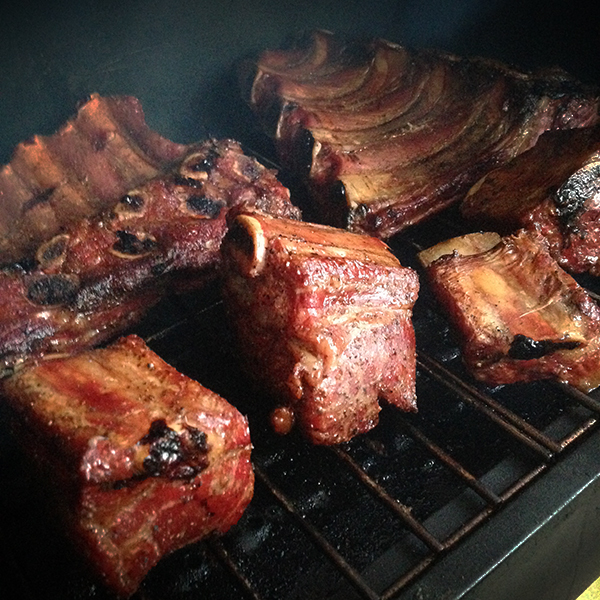 Smoke for around 4.5 hours depending on size, flipping and spritzing with beef broth every hour. Slice and enjoy. Its that easy. Directions:Mix there dry ingredients with olive oil to make a slurry. Lightly cover Prime rib in slurry and let rest for 15 min at room temperature. Place the prime rib in a roasting pan with rack. Next set your Green Mountain Grill to 250 degrees and smoke the prime rib until internal temperature hits 115 (about 20 min a pound). Next turn your grill to 425 and continue cooking until the internal temperature hits 130. Take out and let rest for 15 min lightly covered in foil. Slice and ENJOY! Tried both the corned beef and cabbage recipe and the smoked pastrami recipe over the last two weeks. They were both Outstanding! My wife and my guests all said that the corned beef and cabbage were they best they had ever tasted and could never go back to doing them in an oven. There was not a crumb left after dinner! Thanks for trying our recipes, please feel free to share them with all your friends. I am trying the Beef rib recipe with boneless ribs we got from Aldi. I am currently at the 2.5 hour mark and I am assuming it takes less time because of the missing bones. I just cranked the heat down to 225 and shifted the lesser cooked ribs to the right over the area that seems to always cook faster. I am using a Davy Crockett. They smell GREAT and look really good. I made the mistake of cooking ribs using another smoker recipe earlier in the summer. I toasted them. The family still enjoyed what meat we could get off. Hope they turned out amazing!